Sources in Achchuveali said the practice of the SL military squad involved in abduction is to take the victims inside their vehicle. The motorbike could have been abandoned when the abductors took the victims into their vehicle for transport within the HSZ. Mr. Veeraraj, the Jaffna district organisor of the JVP dissidents and Mr. Muruganathan, left the house from Aavarangkaal Sivan temple area around 5:00 p.m. last Friday in a motorbike with registration number NPGT-7852. 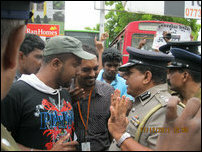 On Saturday, JVP dissident parliamentarian Ajith Kumara, who came from South had to argue with the SL police to stage the protest in Jaffna. After the protest, a group of protestors went to Thinakkural newspaper offices in Jaffna, and when the group came out, they saw their vehicle had been damaged. Residents in the area said a squad believed to be SL military intelligence operatives came in motorbikes and smashed the windows of the vehicle.